Create a Moblin USB Flash Drive using Windows: Moblin is a Linux Platform designed for Netbooks, Mobile Internet Devices, and In Vehicle Infotainment Systems. Mobilin now supported by the Linux Foundation, has been tested on Netbooks and devices such as the Acer Aspire One, ASUS EeePC 901 /1000 /1000H, Dell Inspiron 910, MSI Wind, Lenovo S10, Samsung NC10, HP mini 1010 and 1120NR (with wired networking only). Considering that many Netbooks do not use CD Drives, and ship with Windows, having the ability to install and run Moblin from USB is essential. Download the Win32 Disk Imager and extract the contents of the zip to a folder. Download the Moblin Live Image. 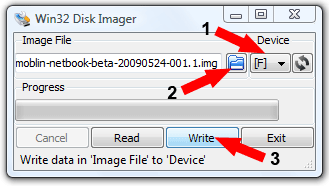 Navigate to your Win32 Disk Imager folder from step 1, and Click Win32DiskImager.exe to launch the Image copying tool. Perform the following steps within the Win32 Disk Imager. (1) Select your USB Flash Drive Letter from the drop down. 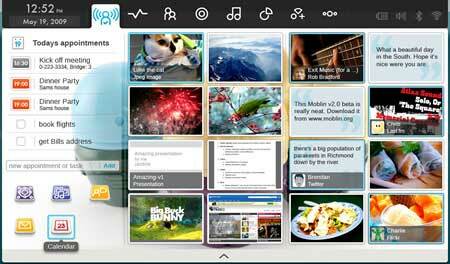 (2) Click the Folder Icon and browse to your Moblin Live Image. (3) Click the Write Button. Once the progress bar has completed and the data has finished writing to the Flash Drive, Click Exit. Shutdown and restart your computer, set your BIOS Options or Boot Menu to boot from your USB device and reboot. If all went smoothly, you should now be up and running from your Moblin Linux USB installation.